Buon Ma Thuot, Vietnam – March 15th, 2017 – Climate change has been affecting Vietnamese coffee industry for nearly a decade and is finally conceded on a state level as a real threat to the country’s economy. 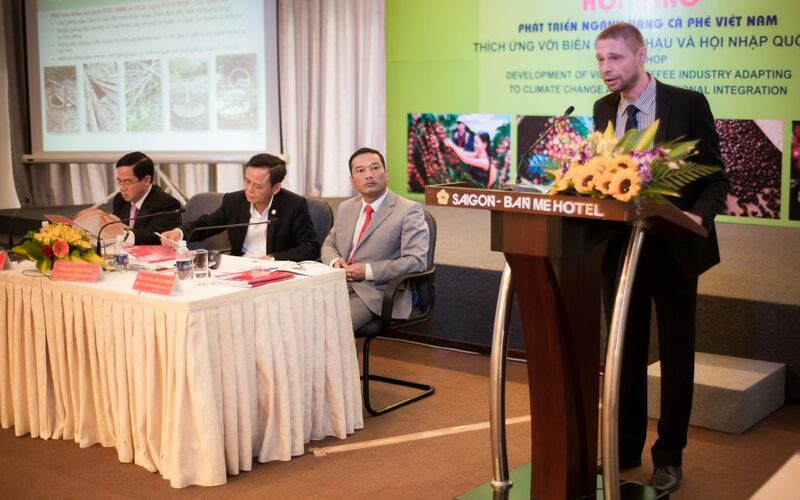 That was one of the central issues discussed at the International Workshop “Development of Vietnam Coffee Industry Adapting to Climate Change and International Integration” organized by the Central Highlands Steering Committee, Ministry of Agriculture and Rural Development and Peoples Committee of Dak Lak in Buon Ma Thuot on March 13, 2017 and attended by a few hundred delegates from roasting companies, farming associations, banks, scientific institutions and state departments. The chairing board included Mr. Dieu K’re, the Member of the Central Communist Party Standing Committee, Deputy Head of the Central Highlands Steering Committee, Mr. Ha Cong Tuan, the Vice-minister of MARD and Mr. Y Giang Gry Nie Knong, the Vice-chairman of Daklak PPC. The workshop was a part of biannual Coffee Festival in Dak Lak. This harsh remark by the workshop chairman, the Deputy Minister of Agriculture Mr. Ha Cong Tuan revealed the essence of another big issue. Being the second largest coffee exporter in the world, Vietnam remains unknown to international coffee consumers who start their morning with a cup of branded coffee made of Vietnamese beans. Apart from the low competitiveness of Vietnamese business the chairman highlighted some other problems of the industry, such as insufficient replantation rate and early blooming taken down by the heavy rains as one of the consequences of climate change. But what’s the use of replanting trees and creating a coffee brand for Vietnam if drastically changing climate ruins the yields by draughts, soil degradation, nematodes, and new species of pests? The consequences of the climate change for the coffee farming have been presented in scientific report by Truong Hong, the Director of Western Highlands Agriculture and Forestry Science Institute (WASI). Mr. Hong emphasized the importance of multiple cropping, water use optimization and training programs for farmers as key measures to tackle the climate change. As a matter of fact, all the above-mentioned solutions have been implemented by the HRNS Foundation for the last decade. The Regional Manager of Hanns R. Neumann Stiftung Dave D’haeze shared the results of the Foundation’s research conducted within coffee&climate in the Central Highlands, which confirm WASI’s observations. Due to immediate interventions through the Nestle/Swiss Agency for Development and Cooperation program HRNS has started quantifying the impact of changing irrigation volumes for coffee, from actual state to best practices by high-resolution monitoring of weather and water variables as well as educating local stakeholders about the advanced water monitoring technology. Mr. D’haeze also introduced a recent pilot project run by HRNS to address expected water scarcity issue by implementing a new system called Managed Aquifer Recharge (MAR). The system is meant to be installed at farms and bring excessive water from slopes of farmlands back to the wells through special filters. First filtering tanks and drainages have been assembled at a few households last week. HRNS experts will carefully monitor the quality of filtered water. The report and action plan of HRNS was greatly appreciated by the participants of the workshop and initiated a hot discussion at the backroom during the coffee break.